I have a Rocker 15 that do pretty much what I want it to do in my band, recording, rehearsal and gigs when the amp is miced. I use it thru a 4x10 Orange cab for more a large sound spectrum. I also have a Tiny Terror HW, but I dont use it often since I need the effect loop for reverb, delay and echo. But... I need more volume/presence when we are doing unmiced gig. I am in a 5 pieces band and my 15 watts dont stand-out enough for the audience. I hear myself correctly on stage, but the audience dont. There is a great deal on a TH30 head near me. It's nice, but I dont need a 4 stage gain (I dont play metal or even Hard rock). I heard great things about the old Rocker 30. Should I try to find one used? It's made in UK but doesnt have a effect loop. Since I have the 4x10 cab, I will be playing the head thu it. I would have thought about the Rocker 32 if they made a head version; I dont need another Orange combo. I want a Orange, to keep a certain constancy in my sound. What do you think? Or maybe someone will say that going from a 15 watts to a 30 watts wont help me get heard more in a unmiced gig. Hard to say. Going from 15 watts to 30 watts is definitely louder, but is it loud enough? Borrow another cab and run your TT in stereo with your main amp. See how that goes. The Th30 is one amp that polorises people's opinions on this forum. Can you try it before you buy? that is the only way to see if it's suitable. I have the terror version of the rocker 15 it's a really good amp and loud ....my ad30htc is a little louder but not by a huge amount. Can larger gigs not be miced up? The Rocker 30 is a good sounding Amp with a loud dirty channel, similar to the rocker 15 but with a bit more aggressive classic rock punky tone.The natural channel is a bit quieter , I've not compared them but I can't see the natural channel on the Rocker 30 being much if any louder than the natural channel on my rocker 15 terror.. Maybe I'm wrong. You could also consider the efficiency of your speakers this can make quite a difference but if you're already using something like V30s they are really efficient already or tweaking your eq or maybe using using less pre-amp gain... Although maybe you don't use too much anyway. Running my amps in stereo is a good idea, but it makes a large rig for a bar gig. Since we are a 5 pieces bands (2 guitars, keyboard, bass, drum), we are usually packed on stage. But it could do a cool wet/dry setting. Maybe I could buy a ppc112 and use it with my Rocker 15 instead of the ppc410. A V30 have probably more punch and presence then my 4 x10 10" speakers. Double the watts =/= double the volume! All you'll get is a bit more headroom, but I don't think there's gonna be a significant volume benefit. Maybe 3-5 dBs. -shape knob - I found only one usable setting and it was somewhere around 11 and 12 o'clock, rest was either too mushy or too shrilly. is very true statement. 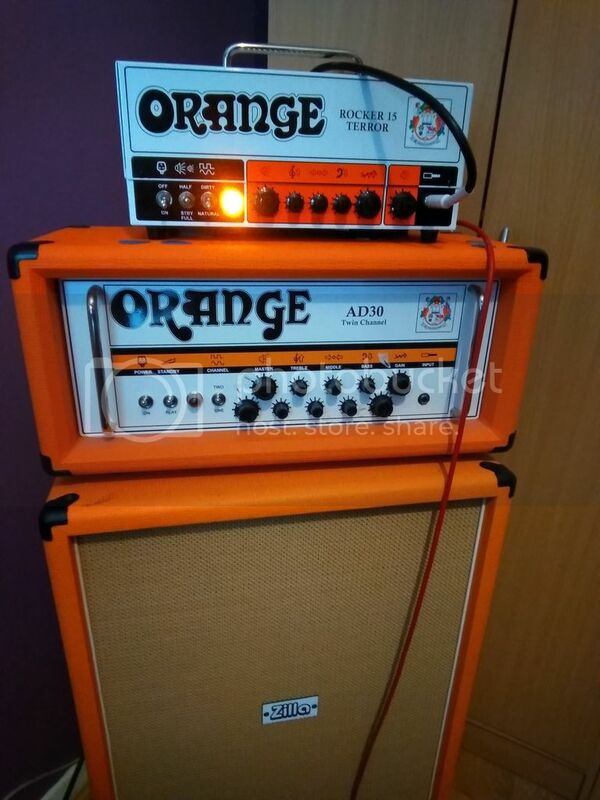 Some folks love it, some hate it, I'd place myself in a "TH30 would be the last Orange tube amp I'd would choose". When you have the clean channel at noon, you're very close to max volume of the amp. I just gets dirtier from there, but you can still have dirty channel louder by a good bit if you turn up the gain. That's not how I use the amp, though. I find the whole left side of the shape knob quite usable, and by keeping the gain below noon, the drive is very smooth. It's not the most intuitive amp out there, though. It just didn't suit your needs. Nice to know! I really like the drive on my TT and my Rocker 15, so the TH30 is probably not for me. I once played in a band with a guitarist that had a Rockerverb. Nice amp, but too loud and dirty for me. Like I have said, I dont really need more volume, but more presence for the audience to hear me. I dont play really distorded and I dont cut my mids (around 11 on the knob). I thought a 30 watts amp would give me that presence. On the plus side, the effect loop is nice. I use alot of delay, verb and echo in my band. Those effects doesnt sound good in front of a Orange amp. In front of my Fender, that sound great, but a Orange needs a effect loop. Nice video. They all seem very similar to me. All of them get that Orange Crunch. The one I prefer is the OR80, ad30 second but I think the Th30 dont sound that bad. I actually prefer it to the Rockereverb. They all sound just fine to me. From your description of what you're playing, I think you'd like it a lot. I use mine pretty much in the same way as the video and I promise you that is a very accurate representation. Save up for a 50 watt amp to be on the safe side or if you need it right away get one on a payment plan. The difference of volume between a 30 watts and 50 watts is not even 3db. It's quite marginal, but a 50 watts will have more headroom. I am ok 95% of my playing time with a 15 watts amp, so a 50 watts is overkill for me. The difference between 50 and 100 watts is 3db, doesn't seem like much, only you know what you need so go for the 30 if that's what you need. I play a 50 watt TV50 at home volume and its not overkill at all.